At 7:07 a.m. local time Sunday, a magnitude-6.7 earthquake rumbled through the island chain of Hawaii, originating near Hawaii island, known as the "Big Island," according to the U.S. Geological Survey (USGS). An aftershock with a magnitude of 6.0 followed seven minutes later. Hawaii's governor, Linda Lingle, declared a statewide emergency after the quake, which knocked out power throughout the islands, damaged buildings and triggered rock slides that blocked roadways. No deaths and only minor injuries were reported, however, according to an Oct. 15 story by the Associated Press. A magnitude-6.7 earthquake struck off the western coast of Hawaii's Big Island Sunday morning, damaging buildings and triggering landslides. Image is courtesy of the U.S. Geological Survey Earthquake Hazards Program. 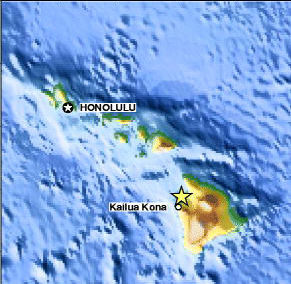 The earthquake's epicenter was located about 39 kilometers below the surface and about 10 kilometers off the western coast of the island of Hawaii, or about 253 kilometers southeast of Honolulu, according to USGS. Shortly after the event, the National Oceanic and Atmospheric Administration's Pacific Tsunami Warning Center in Honolulu advised that neither a Pacific-wide nor a local tsunami was expected to result from the earthquake. Although earthquakes are common in Hawaii, Sunday's quake was the most powerful to strike the state since a 6.7-magnitude temblor in 1983. The most powerful earthquake ever recorded in Hawaii occurred in 1868, when a magnitude-7.9 temblor spawned a tsunami that killed 46 people along Hawaii's southeastern coastline, as well as numerous landslides that killed 36 people. The Hawaiian islands are the most recent in a 5,600-kilometer-long chain of volcanoes thought to have formed in the Pacific Ocean as Earth's crust moves over a stationary "hotspot," a plume of hot magma rising from deep in Earth's mantle (see Geotimes online, Web Extra, Aug. 11, 2003). Most earthquakes in Hawaii are related to volcanic activity and the movement of magma underground, and can occur either before or during an eruption, according to USGS. The state's more powerful earthquakes, however, are generally due to stresses that are more indirectly related to volcanism, says Waverly Person, a geophysicist at the USGS Earthquake Hazards Program in Golden, Colo.
"What happens is the stress builds up in the crust from all the volcanoes on the islands," so that the sheer weight of the islands themselves creates tectonic stress in the crust, Person says. "That's what causes an earthquake of this size." The earthquake's aftershocks "could continue for weeks or even months," Person says. In addition to the magnitude-6.0 aftershock that occurred almost immediately following the main shock, a series of smaller aftershocks continued to rock the islands Sunday and Monday. As of Monday, power had already been restored to most of the state and road crews were cleaning away the rock debris.